Treating LASIK Failures and LASIK Complications without further surgery! When people hear the term “laser eye surgery”, the first thing they think of is LASIK. However, most people are not aware that LASIK is not the only “laser eye surgery”. The other laser eye surgery options include PRK, LASEK, and IntraLase. Each of these optionshas an excellent safety record, and high success rates. These surgeries are intended to treat myopia (nearsightedness), hyperopia (farsightedness) and astigmatism, and, unbelievably, can allow you to lead a life without glasses or contact lenses. Although severe LASIK complications and LASIK failures such as complete or partial loss of vision are extremely rare, many side effects can occur. Like all other surgical procedures, there are potential risks and side effects. LASIK complications commonly include, glare, halo’s and other issues, which are delineated below. LASIK failures and LASIK complications can occasionally be resolved with additional surgery; however more surgery can exacerbate the symptoms. Not every patient is a candidate for LASIK. Specific health and eye conditions and anatomical factors can put you at an increased risk for LASIK complications and LASIK failures. These conditions include, thin or irregular corneas, large pupil size, your specific degree of refractive error, whether or not you suffer from dry eyes; your age, whether your vision is stable, whether you are pregnant, and if you have specific degenerative or autoimmune disorders. Although LASIK eye surgery has been performed on millions of people in the United States, experienced LASIK surgeons report that serious complication rates can be held below one percent. However, like any surgical procedures, there are potential risks and side effects. LASIK failures and LASIK complications commonly include, glare, halos, dryness, ghost images, star bursting, smeared images, loss of contrast, vision fluctuation, blurry vision, and double vision. LASIK failures and LASIK complications can occasionally be resolved with additional surgery, but often exacerbate the problem. Vision disturbances: Halos, glare and starbursts in low vision, especially at night; dry eye symptoms; hazy vision; and reduced sharpness of vision. Flap complications: One of the crucial steps in LASIK surgery is the creation of a thin hinged flap on the front surface of the cornea. In the course of the surgery the flap is lifted for the laser to reshape the cornea. The flap is then replaced and heals naturally. If the flap is not made correctly, it may fail to keep to the eye’s surface causing corneal striae. These LASIK flap complications can lead to an irregularly shaped cornea and cause distorted vision. Keratectasia or Keratoconus: Bulging of the cornea can occur when too much tissue is removed during the LASIK procedure. Or when the cornea, prior to LASIK is weak as evidenced from corneal topography mapping. Rarely does keratoconus develop after LASIK with no known risk factors. Enhancement laser surgery is usually not suitable, and scleral contact lenses, gas permeable contact lenses or, corneal implants may be prescribed. Left: Post LASIK uncorrected HOAs with starbursts at night. Dry eyes after LASIK: LASIK surgery can cause a decrease in tear production and cause your eyes to feel scratchy and blurry. Almost half of all patients experience some degree of temporary dry eye syndrome. People who already have severe dry eye should have been eliminated as LASIK candidates. Significant under-correction, overcorrection or regression. Not all patients will patients will receive 20/20 vision after LASIK eye surgery, and contact lenses or glasses for some or all activities may still be required. If the laser removes too much or too little corneal tissue, or you do not have typical healing, your best vision outcome can be less than optimal. Furthermore, if the laser removes tissue in an uneven manner or your eye heals unevenly, astigmatism can result. Dry, itchy or scratchy eyes. Dr. Irwin Azman has over 25 years of experience in the diagnosis and management of the Post LASIK patient with LASIK failures and LASIK complications. Dr. Azman utilizes non-surgical restoration techniques to restore quality vision to those who have lost it due to LASIK failures and LASIK complications, R-K surgery, corneal transplant surgery, ocular trauma, dry eye and corneal disease. Together with his knowledge and experience, his team of technicians, new technologies in instrumentation and new treatment modalities, Dr. Azman is able to prescribe each LASIK failure patient with the perfect solution in resolving their LASIK complications, without any further surgical procedures. This entry was posted in Post LASIK, PRK, and RK Problems, Scleral lenses and tagged botched eye surgery, botched lasik, can't see after lasik, Contact lens, Cornea, corneal dystrophies, corneal ectasia, corneal trauma, extreme dry eye, IntraLase, Keratoconjunctivitis sicca, Keratoconus, keratoconus treatment, Lasik, LASIK complaints, LASIK complications, LASIK disasters, LASIK dissatisfaction, lasik glare, lasik repair, long term, Pellucid Marginal Degeneration, Post-LASIK dry eyes and poor night vision, PRK complications, PRK haze, Problems of LASIK eye surgery, Radial Keratotomy, radial keratotomy complications, Radial Keratotomy repair, Refractive surgery, risks, scleral lenses, side effects, Stevens–Johnson syndrome, synergeyes lenses on April 24, 2013 by Irwin Azman. Keratoconus is a condition in which the cornea (the lens of the eye) begins to have structural fluctuations, causing it to thin and change to a more conical shape than its normal gradual curve. The cornea has three major parts, the outer layer, epithelium, the central structural portion, the stroma, which provides the cornea’s shape, and the endothelium, which prevents swelling of the cornea. Keratoconus is a disease of the corneal stroma. The stroma comprises over 85% of the cornea, and is made up of collagen, similar to the material on the tip of your nose. With keratoconus, the cornea loses its usual round shape, and develops in to a cone-like shape. In the initial stages of keratoconus, vision will fluctuate, causing astigmatism. As the condition progresses, the cornea becomes too irregular for the use of glasses, and special contact lenses, called Scleral Lenses are needed. The new generation of Scleral lenses are now very comfortable in the eye and most importantly correct the distortion caused by keratoconus. Keratoconus is a progressive corneal condition, and regularly starts in the teenage years. Now with Scleral lenses, people with keratoconus can have great comfortable vision. It’s always in a person’s best interest to avoid corneal transplants and other surgical procedures. 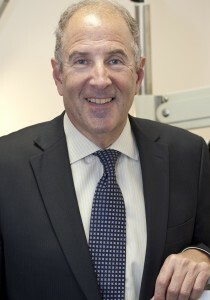 Dr. Irwin Azman specialists in the fitting of Scleral contact lenses for keratoconus, Lasik failures and complications, Pellucid Marginal Degeneration, Stevens-Johnson Syndrome, and other corneal irregularities. This entry was posted in Keratoconus, Scleral lenses and tagged Contact lens, Cornea, Keratoconus, Keratoconus Specialist Baltimore, Keratoconus Specialist in Maryland, Keratoconus specialists, Lasik, Pellucid Marginal Degeneration, Radial Keratotomy, Scleral lens, Stevens–Johnson syndrome on April 8, 2013 by Irwin Azman. Pellucid Marginal Degeneration is a sub-category of Keratoconus. Pellucid corneas involve a larger distorted geographic area usually extending from the inferior corneal margins up to the center of the cornea. It is not unusual for 50% or more of the corneal surface to be involved. Because so much of the cornea can be affected, fitting this type of cornea can be challenging. The problem we face as eye care practitioners is fitting the steep areas if the cornea without adversely affecting the flatter areas. Scleral contacts are large-diameter gas permeable contact lenses specially designed to vault the entire corneal surface and rest on the “white” of the eye (sclera). In doing so, scleral lenses functionally replace the irregular cornea with a perfectly smooth optical surface to correct vision problems caused by, keratoconus, Lasik failures, post-surgical complications, and other corneal irregularities. Because scleral lenses are designed to vault the corneal surface and rest on the less sensitive surface of the sclera, these lenses often are more comfortable for a person with corneal irregularities caused by keratoconus and other corneal irregularities A special liquid fills the space between the back surface of the lens and the front surface of the cornea. This liquid acts as a buffer and protects the compromised corneal tissue. Scleral lenses are designed to fit with little or no lens movement during blinks, making them more stable on the eye, compared with traditional corneal gas permeable lenses. These lenses are almost always very comfortable and the vision provided by them is extremely good. The great majority of patients are able to wear their scleral lenses almost all of their waking hours without problems. Dr. Irwin Azman, Keratoconus Specialists in Maryland, prescribes scleral contact lenses for a variety of hard-to-fit eyes, including patients with Stevens-Johnson Syndrome, Radial Keratotomy and Lasik Complications and Lasik failures, keratoconus, Corneal Ectasia, Post-Surgical Vision Loss, and Pellucid Marginal Degeneration. Dr. Irwin Azman specializes in keratoconus, lasik failures and other corneal irregularities neither avoids nor declines the challenge of prescribing the most difficult cases. Dr. Azman tends to have a perfectionist demeanor. This entry was posted in Keratoconus, Scleral lenses and tagged Contact lens, Cornea, eye care practitioners, gas permeable lenses, Keratoconus, Keratoconus Baltimore, Keratoconus dr maryland, Keratoconus specialists, Lasik, Pellucid Marginal Degeneration, Radial Keratotomy, scleral contact lenses, Scleral lens, Stevens–Johnson syndrome on March 25, 2013 by Irwin Azman. Stevens Johnson syndrome (SJS) and the more severe variant of the disease, toxic epidermal necrolysis syndrome (TENS), are intense autoimmune sensitivity reactions to infections or medications that primarily affect the skin and mucus membranes, including the eyes. Patients with Stevens-Johnson Syndrome have a tendency to have ocular difficulties including dry eyes, eye pain, light sensitivity, scarring, and corneal erosion. Dr. Azman has helped many patients restore vision and quality of life transformed with his innovative treatments. Scleral contacts are large-diameter gas permeable contact lenses specially designed to vault over the entire corneal surface and rest on the “white” of the eye (sclera). In doing so, scleral lenses functionally replace the irregular cornea with a perfectly smooth optical surface to correct vision problems caused by Lasik failures, post-surgical complications, and other corneal irregularities. Because scleral lenses are designed to vault the corneal surface and rest on the less sensitive surface of the sclera, these lenses often are more comfortable for a person with corneal irregularities. A special liquid fills the space between the back surface of the lens and the front surface of the cornea. This liquid acts as a buffer and protects the compromised corneal tissue. Scleral lenses are designed to fit with little or no lens movement during blinks, making them more stable on the eye, compared with traditional corneal gas permeable lenses. These lenses are almost always very comfortable and the vision provided by them is extremely good. The great majority of patients are able to wear their scleral lenses almost all of their waking hours without problems. Dr. Irwin Azman prescribes scleral contact lenses for a variety of hard-to-fit eyes, including patients with Stevens-Johnson Syndrome, Radial Keratotomy and Lasik Complications, Keratoconus, Corneal Ectasia, Post-Surgical Vision Loss, and Pellucid Marginal Degeneration. Dr. Irwin Azman neither avoids nor declines the challenge of prescribing the most difficult cases. Dr. Azman tends to have a perfectionist demeanor. This entry was posted in Scleral lenses and tagged Contact lens, Cornea, dr for scleral lenses baltimore, Keratoconus, Lasik, Pellucid Marginal Degeneration, Radial Keratotomy, Scleral lens, scleral lens specialists, scleral lenses baltimore, Stevens–Johnson syndrome on March 20, 2013 by Irwin Azman. A condition resembling Keratoconus is virtually always caused by refractive eye surgery, specifically LASIK. After LASIK, the cornea has been made thinner. Because the corneal “wall” has been made thinner, internal pressure from within the eye can cause expansion or distension of the cornea. The resultant distorted corneal surface will usually make it impossible to have clear vision with eyeglasses or soft contact lenses. Most of the time a special gas permeable contact or scleral lens will be needed to restore lost vision. These special high tech lenses (which have only recently become available) will act to create a new corneal surface allowing the patient to regain clear, comfortable vision. There are a number of specialized lenses now available that will allow post-surgical patients to function on a much higher level and with a much greater level of comfort. To address the vision and comfort issues that most post-refractive surgical patients are facing, Dr. Azman prescribes Post-Surgical Scleral Lenses. This entry was posted in Keratoconus, Scleral lenses and tagged can't see after lasik, Contact lens, Cornea, Keratoconus, lasik failures, lasik glare, Pellucid Marginal Degeneration, Radial Keratotomy, scleral contact lenses baltimore, Scleral lens, scleral lens Baltimore, scleral lens Maryland, scleral lens specialists, Stevens–Johnson syndrome on March 18, 2013 by Irwin Azman. Dr. Irwin Azman is one of the leading Pre and Post Lasik consultants with over 25 years of experience in the diagnosis and management of the Post Lasik patient with Lasik failure complications. Together with his knowledge and experience, his team of technicians, new technologies in instrumentation and new treatment modalities, Dr. Azman is able to prescribe each Lasik failure patient with the perfect solution in resolving his/her Post Lasik failure complications. This entry was posted in Post LASIK, PRK, and RK Problems, Scleral lenses and tagged botched eye surgery, botched lasik, can't see after lasik, Contact lens, Cornea, corneal dystrophies, corneal ectasia, corneal trauma, extreme dry eye, IntraLase, Irwin Azman, Keratoconjunctivitis sicca, Keratoconus, keratoconus treatment, Lasik, LASIK complaints, LASIK complications, LASIK disasters, LASIK dissatisfaction, lasik failures, lasik glare, lasik repair, long term, Pellucid Marginal Degeneration, Post-LASIK dry eyes and poor night vision, PRK complications, PRK haze, Problems of LASIK eye surgery, Radial Keratotomy, radial keratotomy complications, Radial Keratotomy repair, Refractive surgery, risks, scleral contact lenses baltimore, Scleral lens, scleral lens Baltimore, scleral lens Maryland, scleral lens specialists, scleral lenses, side effects, Stevens–Johnson syndrome, synergeyes lenses on March 15, 2013 by Irwin Azman. Global Complex Eye Care is the preeminent contact lens specialty practice in the greater Baltimore area. Patients are referred to Global Complex Eye Care from eye care professionals throughout the United States. Our practice is specifically designed, equipped, and staffed to provide the Scleral contacts lens patients with nothing but the finest in professional care. As contact lens specialists, we have successfully treated thousands of patients, including many who were previously told they could not wear contact lenses. Optometrists and Ophthalmologists from all over Maryland and surrounding states refer their challenging contact lens patients to Dr. Irwin Azman. providing personalized eye care for contact lens patients. They have earned a reputation by their peers as being the “Doctor’s doctor”. Contact lenses are not what they used to be… even two years ago. Technological advances have greatly improved contact lenses and lens care products – revolutionizing vision correction. Scleral contacts are large-diameter gas permeable contact lenses specially designed to vault over the entire corneal surface and rest on the “white” of the eye (sclera). In doing so, scleral lenses functionally replace the irregular cornea with a perfectly smooth optical surface to correct vision problems caused by Keratoconus, Lasik failures, post-surgical complications, and other corneal irregularities. Dr. Irwin Azman prescribes scleral contact lenses for a variety of hard-to-fit eyes, including patients with Stevens-Johnson Syndrome, Radial Keratotomy and Lasik Complications and failures, Keratoconus, Corneal Ectasia, Post-Surgical Vision Loss, and Pellucid Marginal Degeneration. At Global Complex Eye Care, our doctors keep well informed of emerging technologies by being involved in research studies and FDA clinical trials. We design and develop new contact lenses on an ongoing basis. Our doctors will recommend the contact lenses that will work best for your eyes and your lifestyle. Our doctors prescribe contact lenses made by all major manufacturers, as well as contact lenses from smaller custom labs, and even develop our own unique contact lenses for patients whom other doctors may consider difficult or impossible to fit. Due to our doctor’s vast experience in contact lenses, they often find that patients who have not had past success with contact lenses are now able to enjoy safe, healthy contact lens wear. As experts in the field of contact lenses, our doctors stay involved in research and development of the newest products associated with contact lenses, lectures at vision conferences, and has published numerous articles in professional contact lens literature and journals. You can be assured that our doctors will provide the highest quality of contact lens care, whether your needs are as straight forward as soft-disposable contact lenses, or as complex as fitting lenses for Keratoconus or following corneal trauma. Physicians, Optometrists, and Ophthalmologists from all over the nation refer their challenging and complex contact lens patients to the Azman team. 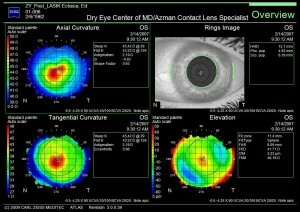 The doctor’s meticulous contact lens evaluation is unique and will not only determine if a patient’s eye are appropriate for contacts; but also will let the Azman team prescribe the correct type of lens that is the most compatible for the patient’s eyes and visual needs. The Azman doctors prescribe all types of contact lenses including; bifocals, progressive, lenses for astigmatism, dry eyes, golf and other sports, color vision correction, theatric, post-lasik, and many other specialty lenses. Only a comprehensive contact lens evaluation will assure long term eye health, perfect all day eye sight, and all day comfort. The Azman team of specialists have redefined and set the gold standard of care in the contact lens profession and are known as the experts by their peers. When it comes to contact lenses they are the “Doctor’s doctor”. This entry was posted in Post LASIK, PRK, and RK Problems, Scleral lenses and tagged Azman, botched eye surgery, botched lasik, can't see after lasik, Contact lens, corneal dystrophies, corneal ectasia, corneal trauma, extreme dry eye, IntraLase, Keratoconus, keratoconus treatment, Lasik, LASIK complications, LASIK dissatisfaction, lasik failures, lasik glare, lasik repair, Optometry, Pellucid Marginal Degeneration, Post-LASIK dry eyes and poor night vision, PRK complications, Radial Keratotomy, radial keratotomy complications, Radial Keratotomy repair, Refractive surgery, scleral contact lenses baltimore, scleral contacts, Scleral lens, scleral lens Baltimore, scleral lens Maryland, scleral lens specialists, scleral lenses, Stevens–Johnson syndrome, synergeyes lenses, United States on March 15, 2013 by Irwin Azman. Dr. Irwin Azman is one of the few contact lens specialists that has extensive experience in the diagnosis and management of the Keratoconus patient. With over 30 years of experience, his team of technicians, new technologies in instrumentation, contact lens materials and designs, Dr. Irwin Azman is able to prescribe each Keratoconus patient with the perfect fit. We are now able to detect the presence of Keratoconus well before subjective symptoms develop. 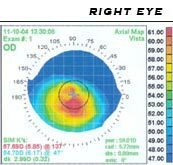 Corneal Topography and Aberrametry measurements have become the standard of care in diagnosing and management of Keratoconus. A computerized system images the shape of the cornea together with the entire optical system by taking tens of thousands of data points. The results are instantly analyzed and wave front topography maps are generated. These printouts will show Dr. Azman a map print (just like a finger print) of the patient’s location and severity of any corneal distortion and high order aberrations (HOA). Azman Contact Lens Specialists is proud to be the first and only ones in the state of Maryland to employ both new technologies, Marco3-D Wave Corneal Analysis and the Opthonix aberrometer for Keratoconus treatment and management. Information concerning your medical health status eye medical status, allergies, family history, and life style and sport activities. Many patients that have allergies have Keratoconus. The computerized corneal topography measures the cornea’s surface combining, wavefront, auto-refraction, keratometry, and pupillometry — allowing accurate and reliable analysis of corneal High and Low order aberrations. For you, the patient, it is a brief, painless, non-contact procedure that photographs your eye’s surface. A noninvasive photographic technique that facilitates accurate and precise diagnosis of corneal disease in the back part of the cornea (endothelium). This instrument can pick up early signs of corneal edema, which cannot be picked up on routine examination. If there is any indication of corneal disease, such as Keratoconus or edema we might recommend a different treatment modality. Corneal specialists agree that it is best to exhaust all non-surgical options for Keratoconus before undergoing corneal transplant surgery, especially for younger patients. Optometrists and Ophthalmologists from all over Maryland and surrounding states refer their challenging Keratoconus patients to Dr. Irwin Azman. This entry was posted in Keratoconus, Scleral lenses and tagged can't see after lasik, Contact lens, Cornea, Irwin Azman, lasik failures, lasik glare, Pellucid Marginal Degeneration, Radial Keratotomy, scleral contact lenses baltimore, Scleral lens, scleral lens Baltimore, scleral lens Maryland, scleral lens specialists on March 15, 2013 by Irwin Azman.